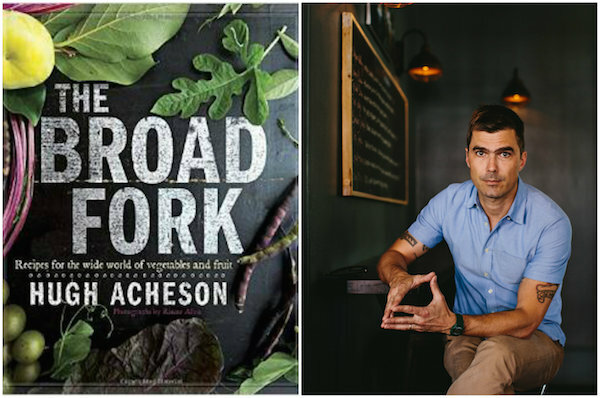 Chef Hugh Acheson released his third book, The Broad Fork: Recipes for the Wide World of Vegetables and Fruits, last month, which I reviewed in a round up of Southern cookbooks recently. It's an exciting cookbook with truly creative combination of ingredients and a focus on using vegetables you might just find at a farmers market or in a CSA box. We got a chance to meet and talk while he was in San Francisco just last week. Where have you been eating in the Bay Area? Any standouts? Octavia, La Taqueria, Deli Board. For coffee--Sightglass, Blue Bottle and Coffee Cultures. Up in Healdsburg--Healdsburg Shed, Scopa, Dry Creek Kitchen. Hana for sushi in Rohnert Park was phenomenal. I'm looking forward to checking out Souvla today. What kinds of restaurants appeal to you the most? I’m always looking for current and contemporary and "ethnic" food. When I travel it’s usually long days, so I don't want a three hour, 12 course meal, I find them exhausting, I don’t eat much, I like to try a lot of things. I like a place with good wine, with good burgundy. Your culinary influences are so diverse—French, Southern, Japanese, Indian, Mediterranean—what is your process for creating a dish? I’m trying to pick up on nuances of flavor. It’s important that recipes are grounded in culinary logic. I try to make sure I’m putting together a puzzle that works, and in the case of The Broad Fork, respecting the actual vegetable. I don’t like overwrought food—I prefer food to be light on the palate. I just want people to cook more. We went through a period 20 years ago of using ingredients and coming up with dishes like wasabi mashed potatoes. It showed a shallow knowledge of cultures. Now we’re cooking a lot more from scratch. Our understanding is much more relevant as ingredients are more accessable. 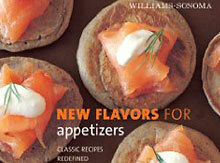 Umami type flavors are more prevalent than ever before. Most of the recipes in the book are not complicated, I’m not having you stuff a chicken and age it in a tree for three months. For years the press has talked about “vegetables moving to the center of the plate.” It’s starting to happen in some San Francisco non-vegetarian restaurants. Will it happen with home cooking, in restaurants? At any of your restaurants? We are moving towards it, protein prices have become exceptionally difficult and it’s hard to have quality and not charge $45 a plate. I don’t eat 6 ounces of protein anymore, 3-4 ounces is plenty. What role does pickling and preserving play in your cooking? The Southern larder is all about pickling and preserving, as we get to the bottom of it and nerd out on it you can see the world’s pantry revolves around those things too. We’re nerds, we are learning whole new genres and saving the season's bounty. What are some good recipes for home cooks who are just getting started with pickling and preserving? Americans get scared by fermentation but they eat and drink fermented food all the time. The fears are real, but there are smart common sense rules. I’d recommend making vinegar, but not just adding tarragon to white vinegar and hoping for the best. Or make sauerkraut. Or carrots with ginger or pickled peppers. Kimchi. Making these things is like science projects for my kids. You are one of the only chefs I know to advocate the use of a slow cooker and pressure cooker. How do you recommend using them? You can make chicken stock in both! I think the slow cooker is just an evenly tempered cooker. You can slow cook lamb shanks over 8 hours. Pressure cookers may not be the chefs favorite things, but they are used everyday in Asia and Mexico—anywhere with legume rich cuisine. Both are excellent at tenderizing. You can make corned beef in 55 minutes, of course that’s after brining for a week. The best beans ever are cooked in the pressure cooker. Once you get used ot it you can control it. They are pretty versatile machines. What’s next for you? More restaurants, cookbooks, TV? Not another book! My full time job is running 4 restaurants. We're opening a coffee shop, we’re very into coffee at the restaurant. I do a lot of public speaking. I have a charitable organization. We are creating a family consumer science program for grades 6-8 to give kids life skills--so they can make a vinaigrette, roast a chicken, poach an egg. So they don’t run into the dilemma of how to feed a family of 4 on 8 dollars. We have a school district that is going to put it into place. I’m also working on a healthy fast food concept. It’s called Broad Fork and we’re trying to form the right alliances. Think large plates, based on the Southern meat and 3 formula. You will make your own plate with protein and lots of salad elements. A cafetaria model kind of like Chipotle. Is healthy fast food the wave of the future? In San Francisco you're going to have Locol—I think Patterson and Choi are on to something. Beefsteak in DC. There’s a big market for changes and disruptive markets. When we say fast food and fast casual, it’s how America eats.